The Ethnography Lab is pleased to welcome Dylan Gordon to the 2015-2016 Speaker Series on Friday, October 23rd, 5-6pm, for a discussion about multi-sited ethnographic fieldwork in Canada. In this talk, Gordon will discuss how the methods of multi-sited ethnography, along with the Actor-Network-Theory injunction to “follow the actors themselves,” were central in overcoming these challenges of access, rapport and theorization. These forms of ethnography are important for making sense of lives which escape traditional forms of anthropological fieldwork and analysis. BIOGRAPHY: Dylan Gordon is a PhD Candidate in anthropology at the University of Toronto. 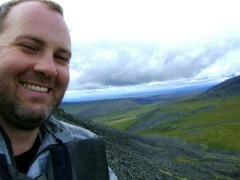 His dissertation focuses on the Canadian trade of wild foods, such as morel mushrooms, cloudberries and fiddlehead greens. He is fascinated by how this form of wilderness industry transports wild foods from the remote bush to urban markets, and in doing so translates conflicting visions of the value of nature—social, ecological and economic. Committed to a public anthropology, Gordon also provides frequent commentary on Canadian food culture in the news media, and is a past winner of the SSHRC Storytellers: Research for a Better Life prize. This talk is open to the public. Free coffee and light refreshments will be provided. Tags: ethnography. Bookmark the permalink.